I haven't posted in the few days, but I thought I would summarize my weekend in one post. If I could use any word to describe the last four days, I would use the word: insanity. Here is why. On Thursday evening, I went to the supermarket to buy groceries. Being me, I didn't take into account the fact that I would have to carry grocery bags filled with vegetables, soup cans, sauce, pasta and other food products in addition to my heavy backpack, laptop and posters I had purchased at the poster sale. Lucky for me, one of my suitemates is a sweetheart and was willing to walk fifteen minutes from our dorm to help carry groceries all the way back. 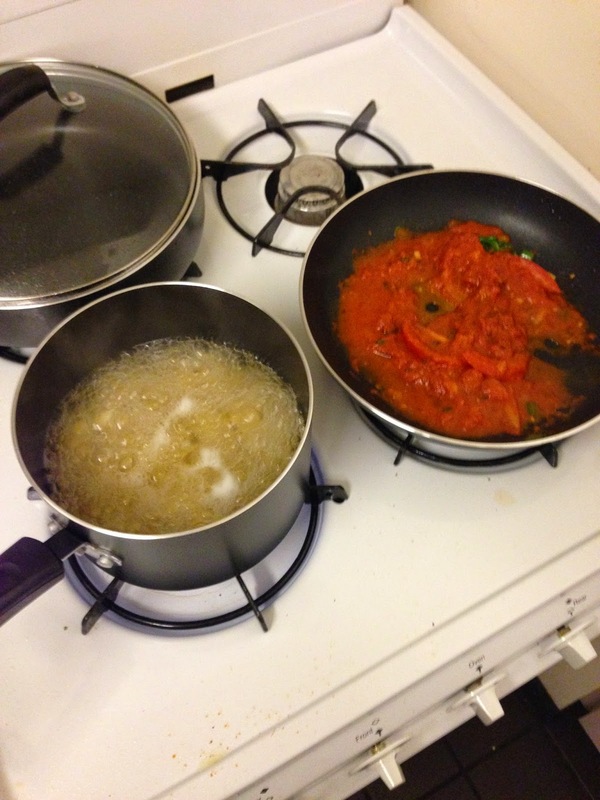 That night, I cooked for the first time! I made vodka pasta with bacon and cilantro. Friday was the second to last day of Rush. 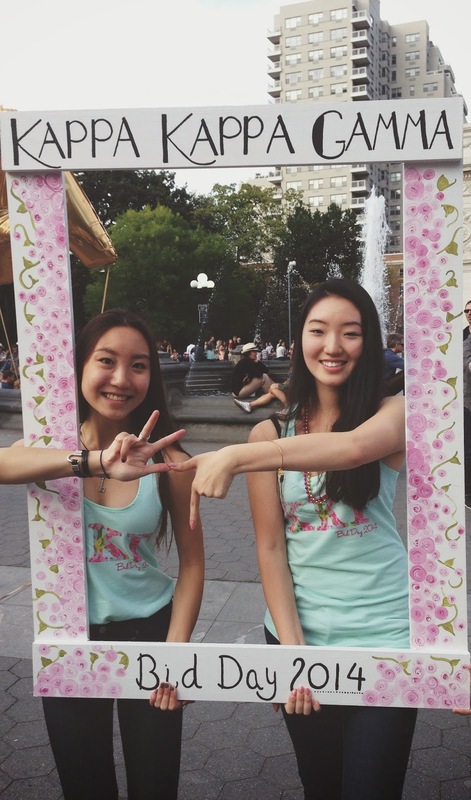 For the past two weekends, I participated in formal recruitment for Greek Life at NYU. Tonight's theme was "Philanthropy Night" and we were required to wear something "business casual". I woke up mid-afternoon and visited my friend Sophia in her dorm on Broome St. where we compared outfits and waited patiently together for 7pm when we would have to attend rush. Philanthropy night consisted of the usual, hour-long girl-flirting that all potential new members must go through during rush. "What year are you?" "Where are you from?" "What is your major?" "Where do you live?" "Why did you decide to join formal recruitment?" The process is overwhelming, yet it gave me some tips on getting through a job interview, as we were asked the same questions over and over again throughout the night. The next night's theme was "Preference Night", a but more fancy but ultimately the same dress code. Here was the night when we would decide which sorority we would prefer to join. Of course, it started raining just as we were finished, so I huddled under Sophia's umbrella and we walked back to her dorm to have dinner before attending Alice's Adventures in Wonderland, a ballet playing at Lincoln Center. The ballet was absolutely amazing, but I have to say that the amount of visual effects they used throughout the performance made me feel as if I were going a little bit insane. Stagecraft did an unbelievable job; I really enjoyed my first ballet in NYC! When I got home, I made soba noodles as a midnight snack while I mentally prepared myself for Sunday's rush theme: Bid Day. I think I probably maxed out my insanity level as we were waiting for our rho gammas to arrive with each of our bids. I was so anxious even my phone couldn't distract me from one of the most important events in my life. That small, seemingly unimportant piece of paper would determine my greek home for the rest of my life. After all the waiting, shuffling, impatience, anxiety and hope, I am honored to say that I chose Kappa Kappa Gamma as my future sisterhood. I am beyond excited to be a part of "Reading is Fundamental" and I hope to make some of the most wonderful memories with my future sisters.